Love Our Children USA announced today the Third Annual BLUE SHIRT DAY™ – WORLD DAY OF BULLYING PREVENTION to kickoff National Bullying Prevention Awareness month during October. 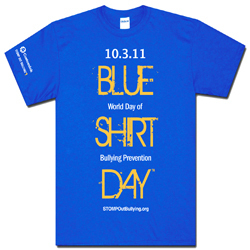 The Blue Shirt Day™– World Day of Bullying Prevention is an initiative of STOMP Out Bullying™ to combat bullying and cyberbullying. This time of year should be an exciting time for students returning to school …learning, seeing old friends and making new ones; but the reality for many is often very different. They’re the victims of bullying at school, on playgrounds and online. They’re afraid to go to school for fear of being bullied. To signify the importance of National Bullying Prevention Awareness month, STOMP Out Bullying™, a signature program of Love Our Children USA™, created Blue Shirt Day™- World Day of Bullying Prevention which is observed on the first Monday of October. On this day, we ask kids and adults alike to make Monday, October 3rd, the day that bullying prevention is heard around the world by wearing a Blue Shirt in solidarity to STOMP Out Bullying. With the new school year beginning, this is a call to action for students, schools and workplaces across the country. Hundreds of schools across the country have agreed to participate and many more are expected to join. This year’s campaign not only offers a newly designed “limited edition” blue shirt, it will create an even greater awareness with a PSA. The PSA will air on major TV and cable networks, as well as online. STOMP Out Bullying™ offers students a safe haven. From information and resources, to an online area where youths can talk about the issue, to getting involved in social media efforts, signing a petition, raising awareness, Blue Shirt Day and celebrity PSAs and a HelpChat Line for kids and teens who are bullied, cyberbullied and at-risk for suicide, and a soon to be launched area where students can upload videos about their experiences with bullying and why they want to end bullying. We ask kids, teens and adults to participate BLUE SHIRT DAY™- WORLD DAY OF BULLYING PREVENTION by wearing the STOMP Out Bullying™ “limited edition” blue shirt or wear their own blue shirt. And from September 29th – October 19th the biggest celebrities will participate in the Fourth Annual STOMP Out Bullying Auction on charitybuzz.com. Some of last year’s celebrities include: Paul McCartney, Elton John, Bill Joel, Bette Midler, Ellen Degeneres, Celine Dion, Bryan Adams, Dancing With the Stars and Tom Bergeron, American Idol and a host of other very notable stars. The parents of Scott Walz, Sladjana Vidovic, Phoebe Prince, Carl Joseph Walker-Hoover, Jesse Logan, Hope Witsell (Florida), Ryan Halligan and all of the others who took their lives know only too well, because they their kids could no longer take the daily torment. 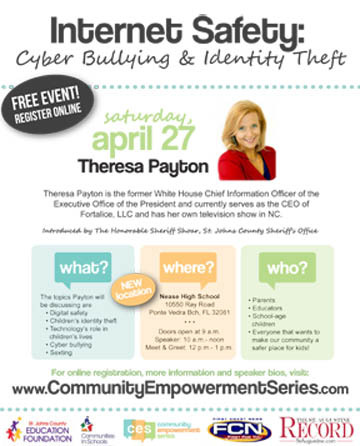 They might be here today if their schools had listened and taken a stand against all forms of bullying.Students should be educated about the harmful effects of bullying and cyberbullying. They can begin by observing and participating in National Bullying Prevention Awareness month and BLUE SHIRT DAY™- WORLD DAY OF BULLYING PREVENTION. To learn more about hoe you can help your child handle bullying or if your child is a bully, visit www.stompoutbullying.org. Sue Scheff: Texting – New App to Cover Your Tracks, but does it Encourage Cyberbullying? TigerText, and according to the founder Jeffrey Evans, not named for the infamous text messages with Tiger Woods, is the latest gadget (application) to help people cover their tracks when they hit send a bit too fast. We have heard this time and time again, think before you hit send. 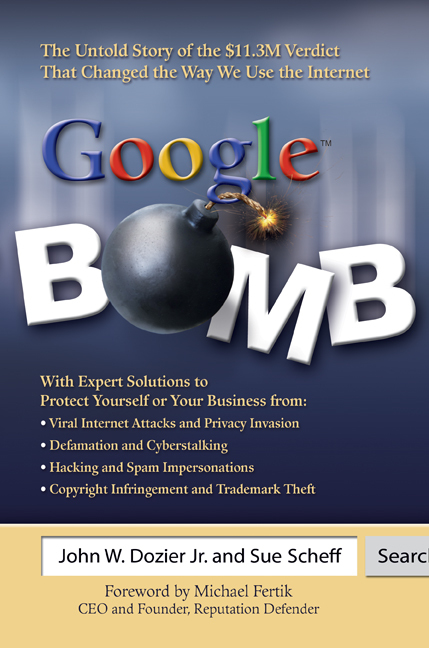 Know that when that email or text goes out into the world of digital warfare, it is gone. From there it can be forwarded, copied, pasted, manipulated and worse. It could end in the wrong email box! Did you mean to send Michael your friend or Michael your boss that not-so-funny joke? Everyone has had that feeling after they hit send when they are typing so fast, that the automatic window of programmed names comes up and you have more then one person with the same name, with a flick of your finger, it is gone – just as you see the last name is wrong! TigerText can’t help you there, but if you send a text that you want eliminated after the person has read it, they can help you. With TigerText you can literally program it to delete your message from 60 seconds to 30 days after it has been read. The catch: You have to have an iPhone (however it will soon be available on Blackberry and Android) and both parties have to download the app. Is it worth it? To some people it is exactly what they have been waiting for. With school opening soon in Broward, Dade and Palm Beach Counties, it is time to think of the consequences of apps like TigerText. Will it encourage cyberbullying? Will the bully now believe their evidence will be destroyed? Will it become more difficult to trace the nasty text messages? Ross Ellis, Founder and CEO of Love Our Children USA, believes that this is exactly what can happen. Her concerns that this type of product/app can increase and create more problems with bullying and cyberbullying. Watch video to understand how TigerText works. Read more. 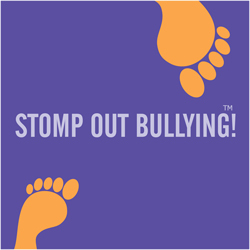 STOMP Out Bullying™ is an initiative of Love Our Children USA™ the National nonprofit leader that honors, respects and protects children. Its mission is to break the cycle of violence against children. Since 1999, it has paved the way in prevention and has become the ‘Go-To‘ prevention organization for all forms of violence and neglect against children in the U.S. STOMP Out Bullying has proudly launched their new website as a new school year is about to begin. This website offers a vast amount of educational and valuable information on bullying prevention, hotlines, and many fantastic celebrity videos and PSA’s. For parents, educators, administers, daycare providers, STOMP Out Bullying new website also offers an adult page. 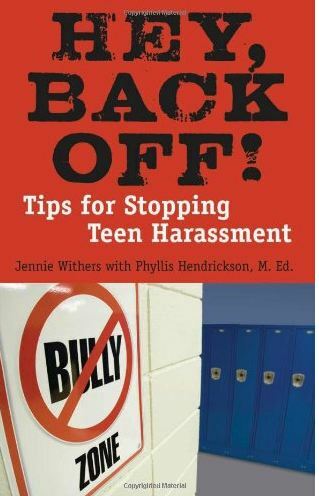 On this page you will find tip sheets to help you understand and prevent bullying and cyberbullying, as well as cell phones and mobile safety. With school only a few weeks away, take the time to be prepared and educated on a very serious concern today, bullying. Bullying hurts. Watch video are read more.